Dear Animoog enthusiasts, rejoice! A few weeks ago Moog Music released a new stellar app-instrument, modern replication of their Model 15 modular synth from 1973 as an app, this time we get a modern version of the iconic Minimoog synthesizer initially built in 1970. 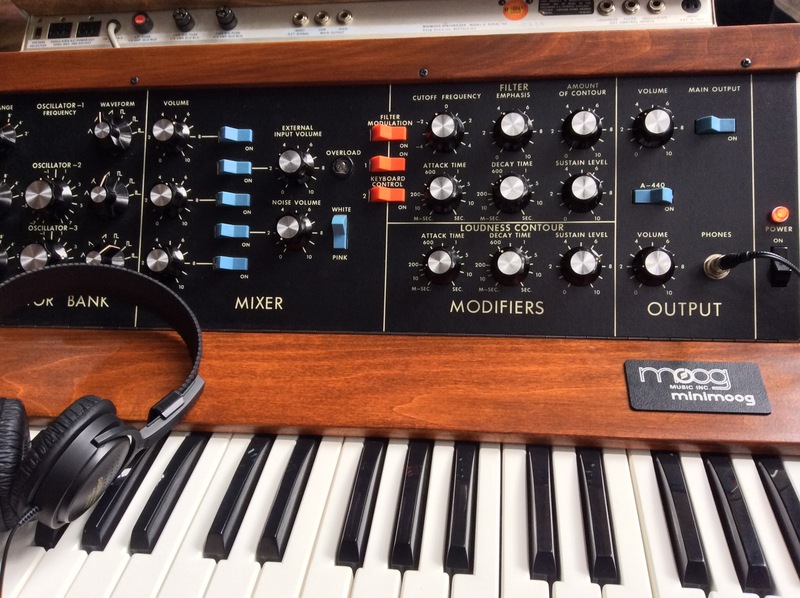 The Minimoog is absolutely relevant today and remains an excellent tool not only to play great synth sounds live, but also for learning and experimenting with sound synthesis. Amongst the significant new features Moog added to the app over the real-life Model D, you get “[…] the ability to play chords with up to four-note polyphony, an easy-to-use arpeggiator for rhythmic pattern creation, a real time looping recorder with unlimited overdubbing capacity, a tempo-synchronizable stereo ping pong delay module, and the Bender — a wide-range stereo time modulation effect module. The Minimoog Model D App also supports AUv3 Audio Unit extensions, which allows multiple instances of this powerful instrument to be used simultaneously […]” All these features brings lots of value to players and tinkerers amongst us. Here’s the official Model D announcement video. This Moog app goes beyond the current versions of Model 15 and Animoog in terms of features and I can only hope these older Moog apps will eventually benefit from the nice things Model D can do. Given that Model D’s price is less than a meal at a restaurant and considering that a physical Minimoog Model D synth will cost you several thousand dollars, it’s a bargain and the sensible thing to do is to head right away to the App Store! While the Minimoog really invites you to explore sound synthesis from scratch, I personally like presets as starting points and inspiration. It feels like standing on the shoulders of giants. Model D ships with over 160 presets and offers hundreds more in its in-app store. If you search the web, you’ll find a lot more. And I’m going to give you a head start, here’s the 3 thousands presets we have for Animoog. Furthermore, in Tom Rhea’s Minimoog Sound Charts, you can even find the appropriate settings to play classic instruments such as the harpsichord, the cello, the flute, the clarinet, the trumpet, the xylophone and so on. Here’s a test solo track I improvised with Model D made with haQ attaQ’s ‘init’ preset, which I modified a bit. Jakob gives this Model D preset to RISE 42 synth solos album heavily rely on this incredible product. I didn’t told anyone at the time, my apologies. I’m excited and have been writing a detailed article on using MIDI Expression with synths, you can simply subscribe to Animoog.org’s newsletter, or follow the Facebook page or the Twitter account to ensure you don’t miss it once I publish it. Meanwhile, the following ‘Embrace m’ track provides an example of improvising with two expression pedals connected to the Model D app. While I started by reading the Model D manual — reviews were obviously not available during the Beta testing phase — I’ll completely understand if you favor watching videos first! Amongst the most interesting ones, I selected the next two videos from haQ attaQ to share with you. They clearly explain modulation sources and how the filter works on the Minimoog. Absolutely valuable. Years ago when I was looking for documentation on sound synthesis and synthesizers, one of the nice people who replied suggested experimenting with sound as one of the best way to understand sound synthesis. To help you in the process, Moog provides useful documentation. You can have fun with Model D without reading the manual, but to improve your understanding of the synth, and thus your ability to make it sound like you envision, you’ll likely need time reading and experimenting. Unless you’re already an expert, you’ll want to read the ‘Understanding Sound and Synthesis’ section. And even more important to learn to use the Model D app-instrument, head to the ‘Features and controls’ and ‘Using the effects’ sections. Here’s a tip before you dive. In my experience, the in-app manual is a bit awkward to use (as an example, it doesn’t remember where we were reading if you leave it momentarily to turn knobs a bit and go back to the manual), but there’s a workaround: you can access the full Model D manual on this official webpage. It’s easier to search and to switch back and forth to the app. While we’re into exploring sound synthesis with Model D, the timing is good for an insightful introduction to synthesizer basics by the Suzanne Ciani herself. I mentioned MIDI Polyphonic Expression (MPE) several times in the past — this crucial modern MIDI standard elevates synth expressiveness to new levels. Unsurprisingly, Model D supports MPE as shown in this short demo where Jordan Rudess’ GeoShred app is used to control Model D through MPE. In the previous picture, I’m saying hi to all synth enthusiasts from at Moogfest 2016 and it’s only now, thanks to this new Model D app, that I’m happily renewing ties with it. I’m glad we all have this opportunity now. 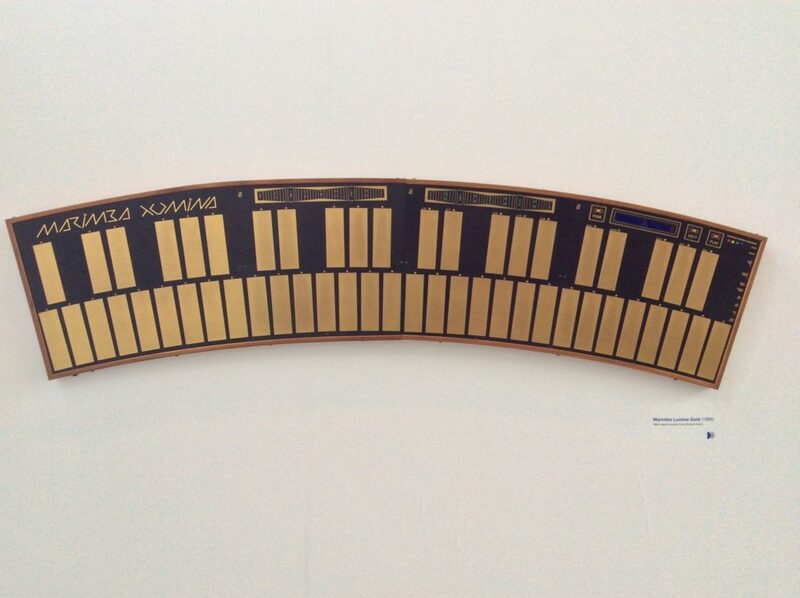 It’s really with Animoog that I started exploring the richness of sound synthesis. In the past few years, this interest led me to learn a lot about the state of modern synthesizers and how we got here. 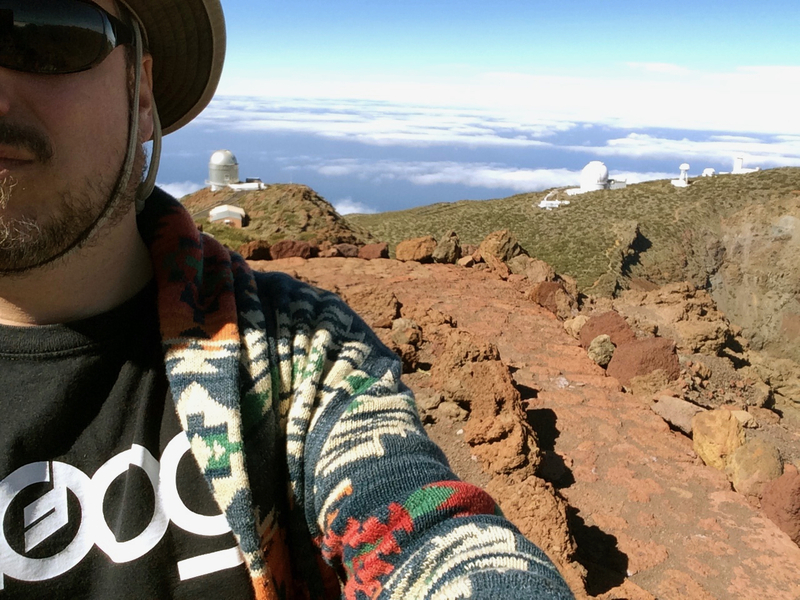 At some point I learned about Moogfest, the annual, multi-day music, art and technology festival. 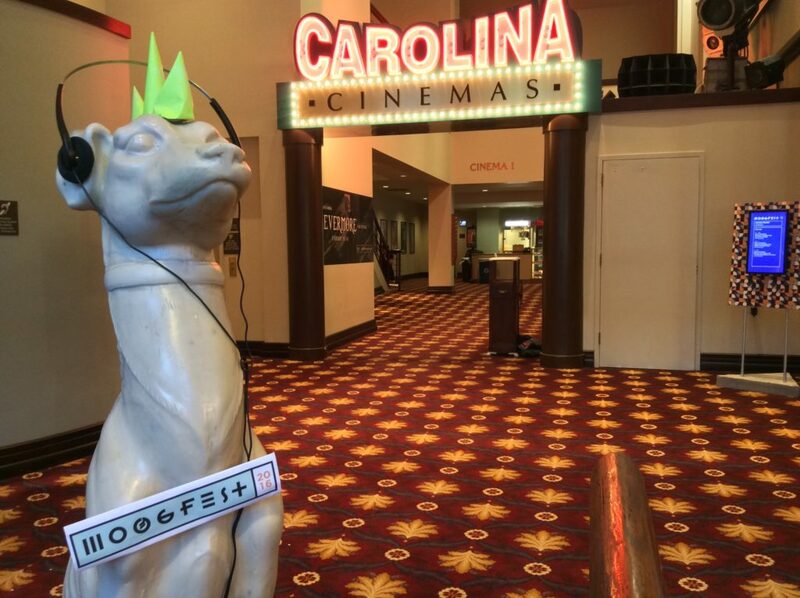 Moogfest 2016 took place in Durham, North Carolina, May 19-22. After years of discussing and sharing tips online with other Animoog players, releasing albums of Animoog solos and of course, running Animoog.org, Moogfest constituted an excellent opportunity to go beyond my iPad screen and commit to meet in person other like-minded people. I wasn’t certain what to expect before getting there but I was instantly amazed by the joyful ambiance amongst participants. 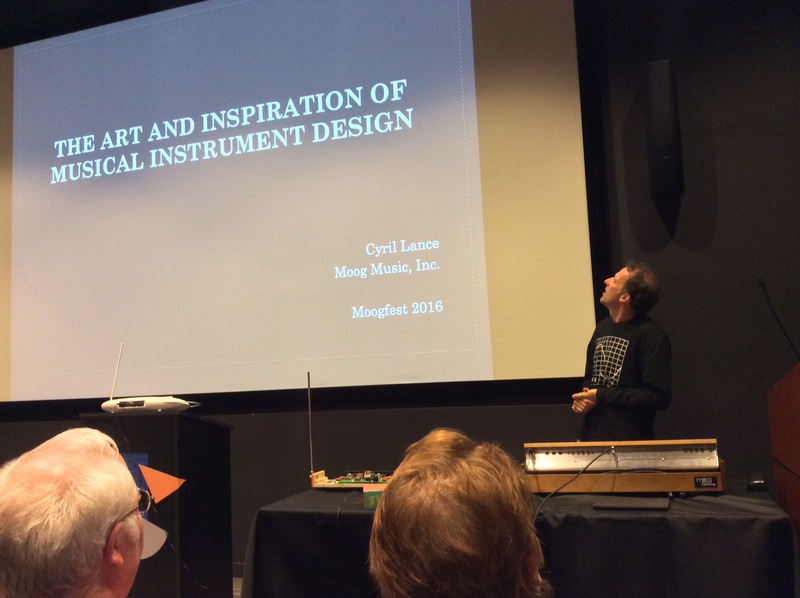 Moogfest 2016’s had an ambitious program which “included 5 durational sound installations, 11 film programs, 13 art installations, 67 conversations, 100 workshops and 119 performances.” The quality of the talks and activities during the day was very high and I also appreciated several unique musical performances. I even met with the early and current developers of Animoog! There you go, here’s my report on participating to Moogfest 2016. I care a lot about controllers because they directly impact expressiveness of the instruments they’re attached to. Animoog’s polypressure keys certainly explain part of the success this synth has. While there’s lot to do and hear at Moogfest, there’s also lot to see. 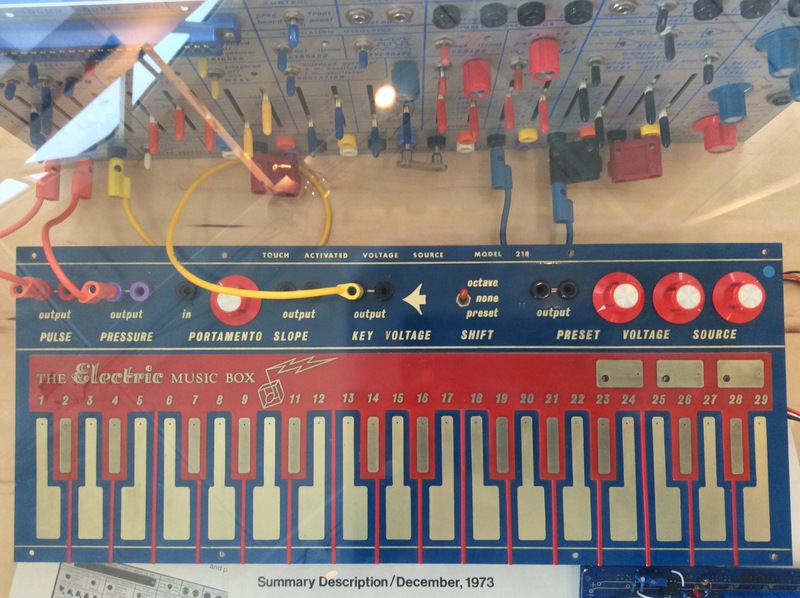 Here’s two controllers from Richard Smith’s collection of Buchla Electronic Musical Instruments. 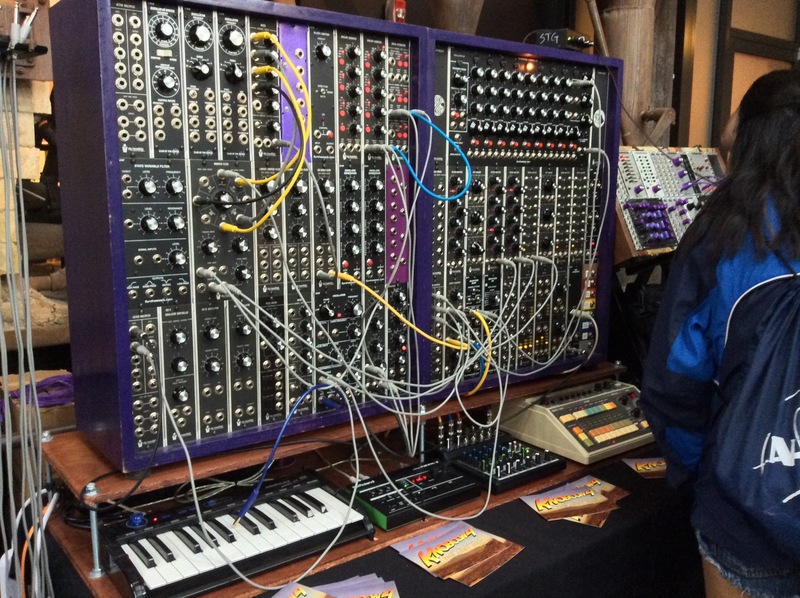 Don Buchla was at the origin of the synthesizer era along with Robert Moog. 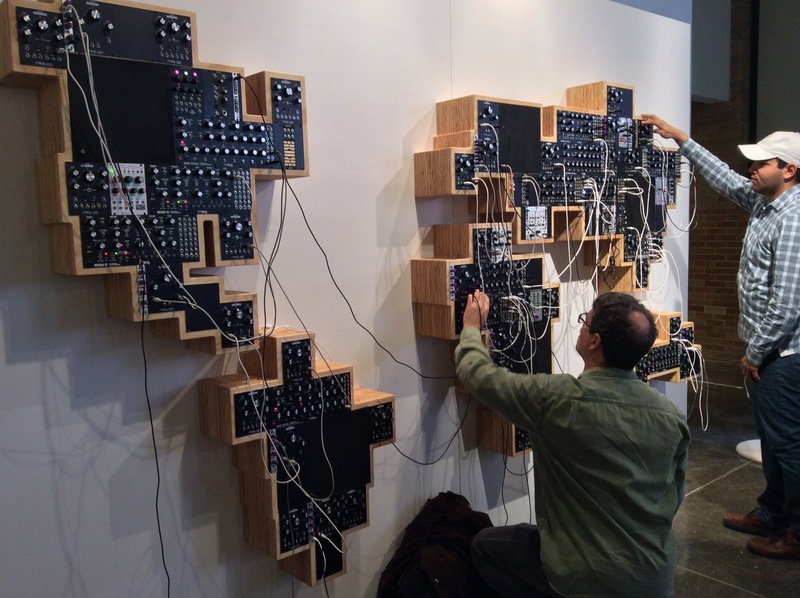 It was a good idea to spend time at Moogfest installations before things started to get crazy! The few opportunities I had to play with others Moogfest participants were well appreciated as it made us share our love for playing electronic music. 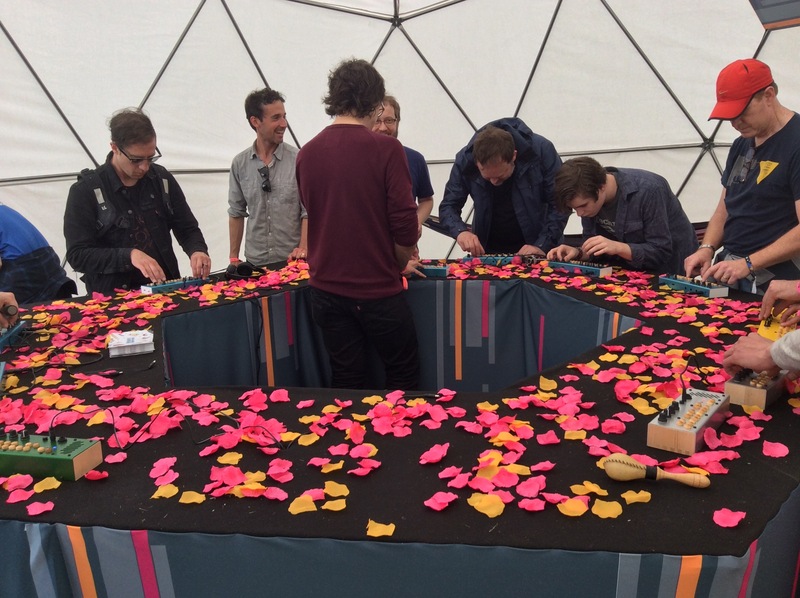 The ‘Ten Minutes Music’ installation brought three enthusiasts together to play a short track one after the other before they get mixed together. 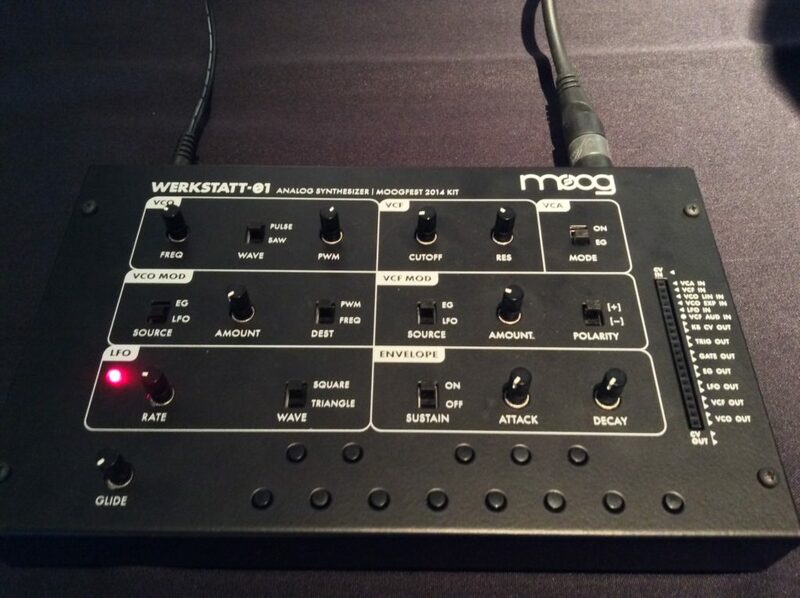 I ended up playing the Werkstatt-01, which is a synth you can build yourself and introduced at a Moogfest 2014 workshop. That’s right, Moogfest workshops can last up to several hours. 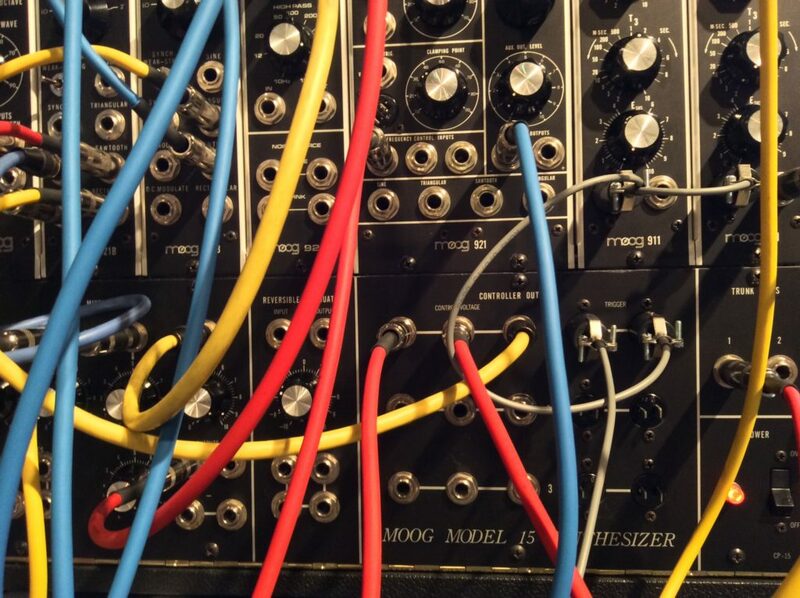 At Moogfest 2016 participants could build their own synth in a 6 hours workshop. There’s plenty of exciting workshops during Moogfest on a variety of music, art and technology topics. Here’s a tip: some workshops have limited-capacity and you need to purchase higher priced ‘engineer’ tickets to increase your chances of having a spot. By the way, participation to the festival is fairly cheap considering you can get General Admission tickets for as little as 99$ if you purchase your tickets at pre-sale discounts. 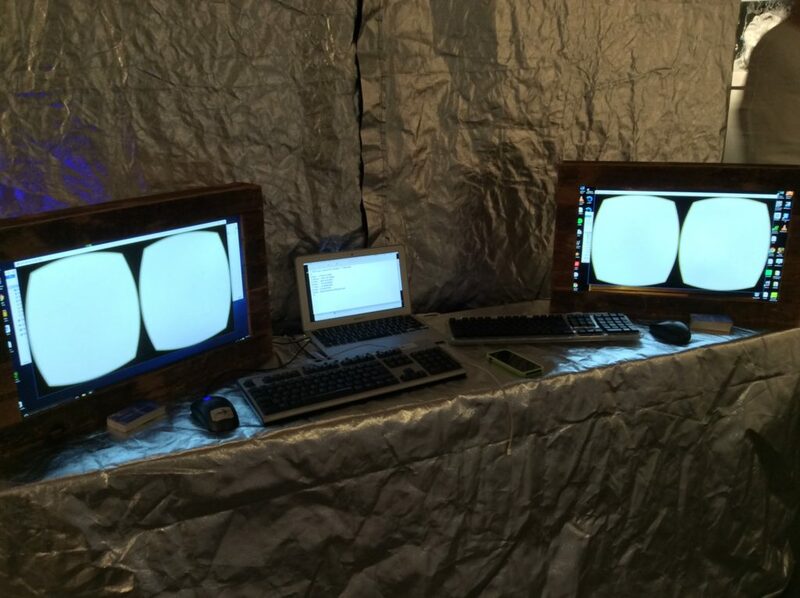 So I did not get a spot on the popular music in virtual reality workshops but I was able to experience Flatsitter’s Theta virtual reality spa which made us explore a beautiful world. Most of us have seen what virtual reality brings in terms of creativity, but experiencing it was marvellous. Virtual reality will not be a fad. 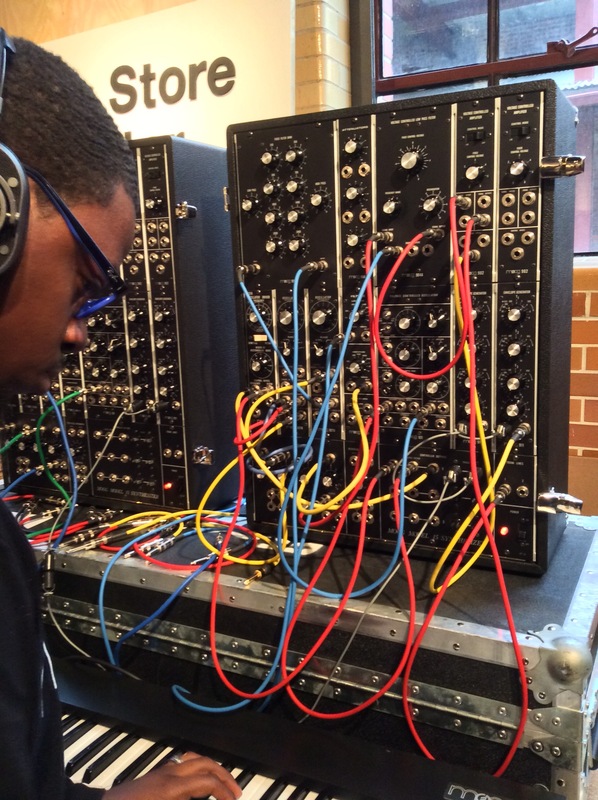 I spent lot of time at the Modular Marketplace and the Moog Pop-Up Factory since there were so many instruments to discover and play with! It was one of the rare occasions where I could play on classic synths such as the Minimoog. 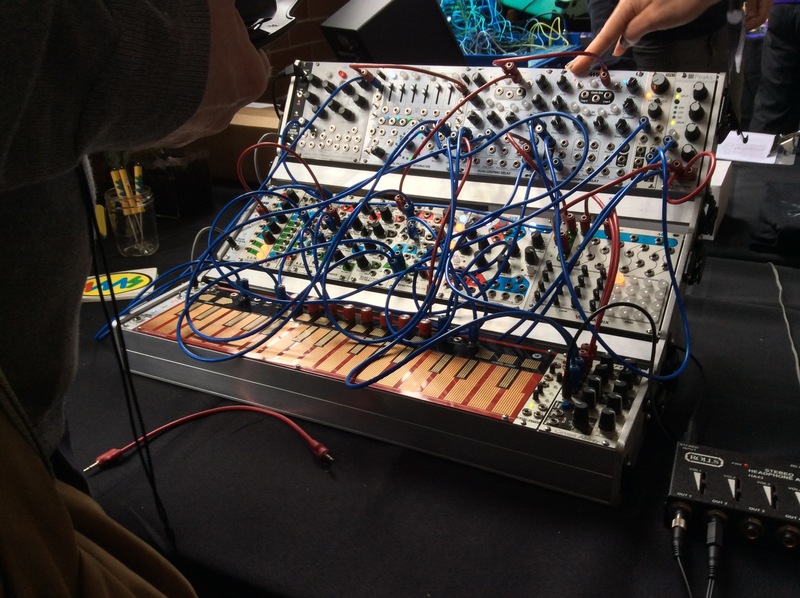 The Modular Marketplace offered a quantity of nice looking modular synth with friendly people ready to tell you all about their creations. There’s even guided introductions to the marketplace, helping us make sense of everything there is to see. 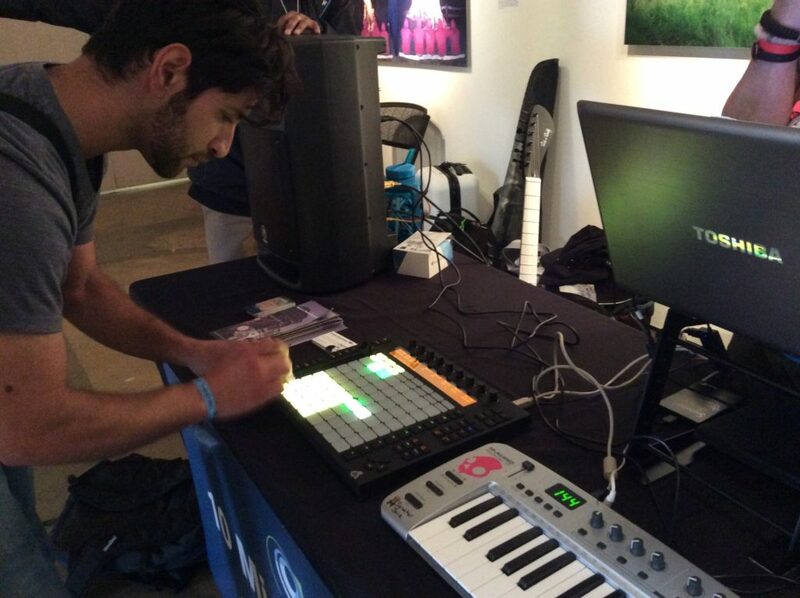 There even was an Artiphon booth and they were kind to let me test it with Animoog. But wait, a wonderful surprise was waiting for me in Moog’s Pop-up Factory: two real Model 15 modular synths! And we could play with them! I must have spent 30 minutes playing on the real Model 15. I was super excited considering I spent weeks beta testing the Model 15 app and even releasing a free album of Model 15 solos made with the Model 15 app. Moog Music officially released the Model 15 app barely two weeks before Moogfest. My first impressions are that while I appreciate the ease of reaching out knobs on the real thing, the Model 15 app has modules that the physical Model 15 synth does not have and which make a significant difference to me in favour of the app. Moog’s Pop-Up Factory has also been an opportunity for Moog to begin the pilot production of the Minimoog Model D, returning after over 30 years. 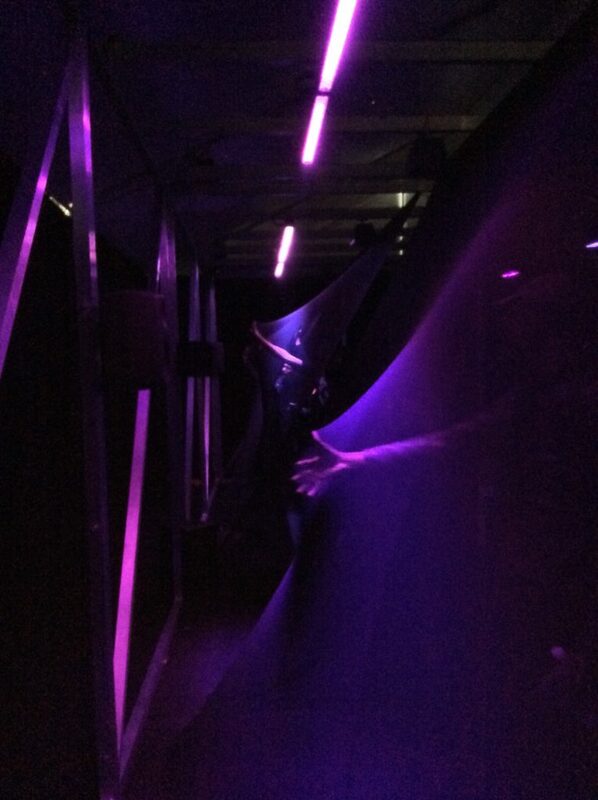 I headed off to experience Microsoft’s installation which tracked movements of participants with 4 kinects and used interactions with physical nets to modulate the track Realiti by Grimes. Grimes was also one of the numerous artists to perform at Moogfest 2016. Another opportunity during which I could play with other musicians was at the Aloft Hotel Musical Playground. I am amazed that a group of strangers can play something harmonious with simple but yet interesting instruments, Critter and Guitari’s Organelle in this case. Two years after launching Animoog.org and acting for over a year as beta tester for Moog’s Animoog app and, more recently, the Model 15 apps, meeting with Moog developers at Moogfest has been a significant highlight to me. While I have exchanged countless emails with upcoming Expressive-MIDI standard. I had the opportunity to have a long chat with Moog product developer Amos Gaynes who was involved since the very beginning of Animoog and who shared interesting stories about its coming to existence. Thanks Geert and Amos! Albeit shorter discussions, I’ve been happy to meet Moog’s Chief engineer Cyril Lance as well as Social media manager Jim DeBardi. 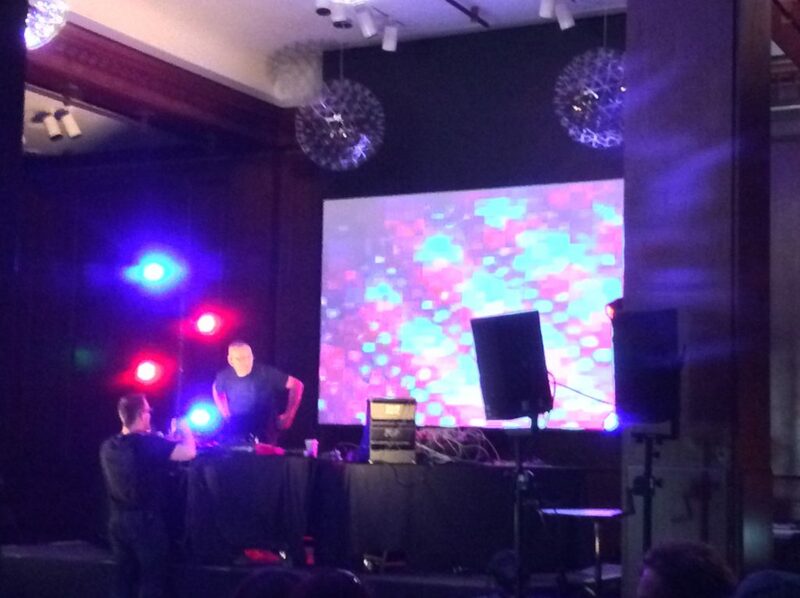 Those encounters were another reason why Moogfest is a special event for Animoog players such as myself. Maybe one day I’ll dive into compiling in writing the history of Animoog’s development? At night times, I saw several pretty interesting shows of different styles. Paradoxically refreshing to see Silver Apples perform on stage, straight from the 60’s and playing live electric music. I was ecstatic to attend a show by Daniel Lanois, who worked with Bob Dylan, U2, Brian Eno and many more. But it gets better since Moogfest features Masterclasses, a rather intimate conversation with the artists. 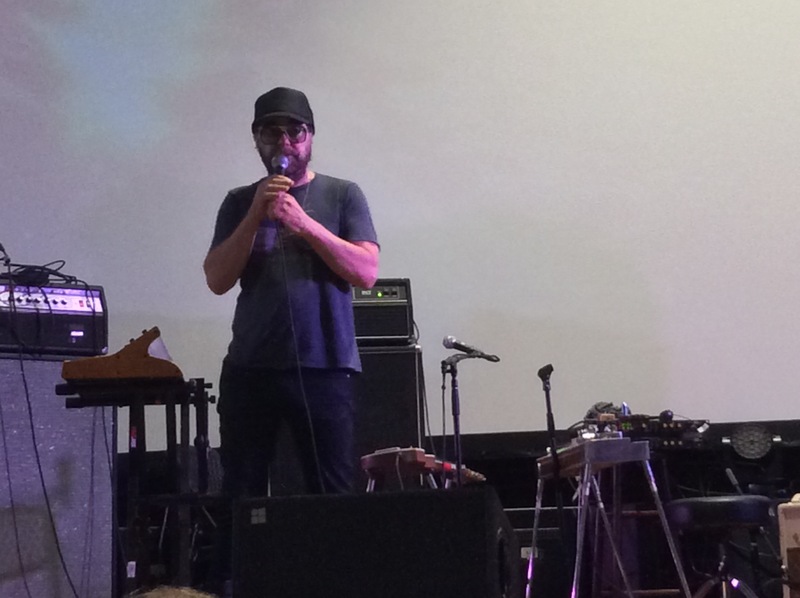 We were about 50 to attend Daniel Lanois’ Masterclass and have the opportunity to go on stage with him and ask questions – that could not have happened anywhere else. 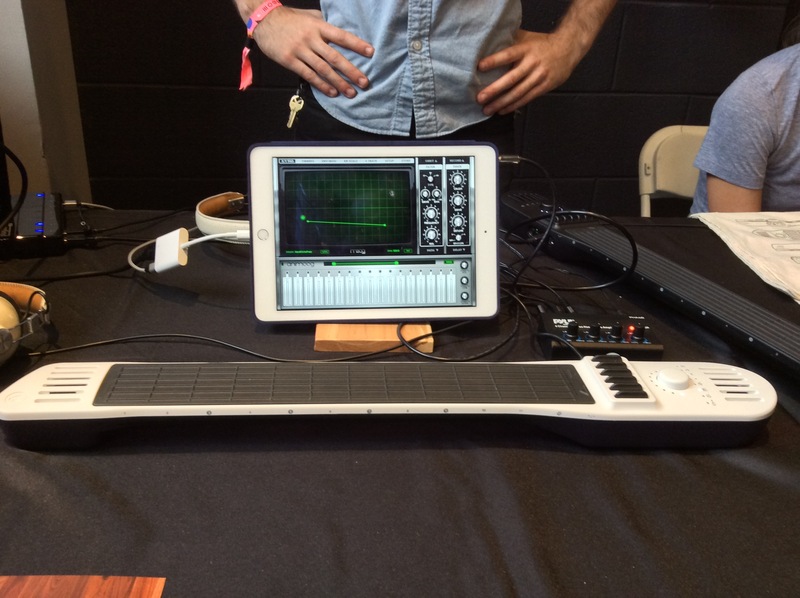 One of the electronic music stars participating to Moogfest was sound designer Animoog presets. I was lucky to met with him later during the festival to have a brief chat and shake hands. Here’s Richard at the beginning of his 4-hours durational sound installation. Here’s a track made with Richard Devine’s ‘DreamCycles’ Animoog preset, part of my ‘Pianimoog •• discoverY’ album of free Animoog solos. While this report focuses on Animoog because thats the purpose of this website, it’s important to know that Moogfest is not about showcasing Moog products: it’s a festival for art, technology and electronic music enthusiasts. Everyone is welcomed. Moog Music is known for the quality and the love they put in their products. Having recently become an employee-owned enterprise, it’ll certainly help them retain their cult status. There were plenty of ‘Conversations’ during daytime at Moogfest, and all those I attended were of outstanding interest. ‘Conversations’ essentially are presentations interlaced with questions from participants. Amongst those I had the chance to attend was the talk on crowdfunding and micro-manufacturing musical devices with Andrew Kilpatrick of Kilpatrick Audio, a thesis on the death of music mastery by Mike Butera from Antiphon, in the Synth Design Icon themed conversations, I attended Tatsuya Takahashi from Korg and another one by Moog Music’s Cyril Lance, one of the creators of Animoog! One of the numerous interesting bits that Cyril shared is a saying from Bob Moog himself: « God is in the details » => details are actually what make things great. There were plenty other interesting talks from people such as Tod Machover from the MIT Media Lab and Laurie Anderson, former NASA artist-in-residence. 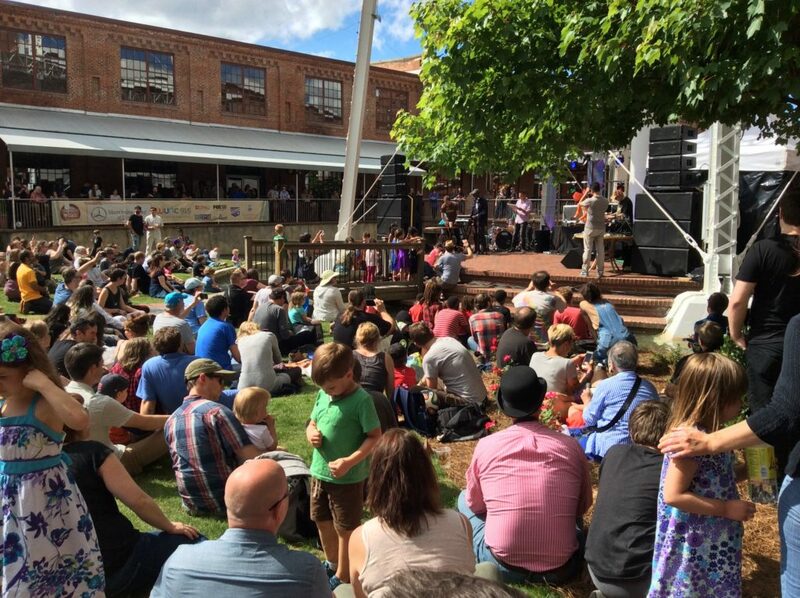 While I think the event is clearly targeting adult music geeks, Moogfest also appeals to families. 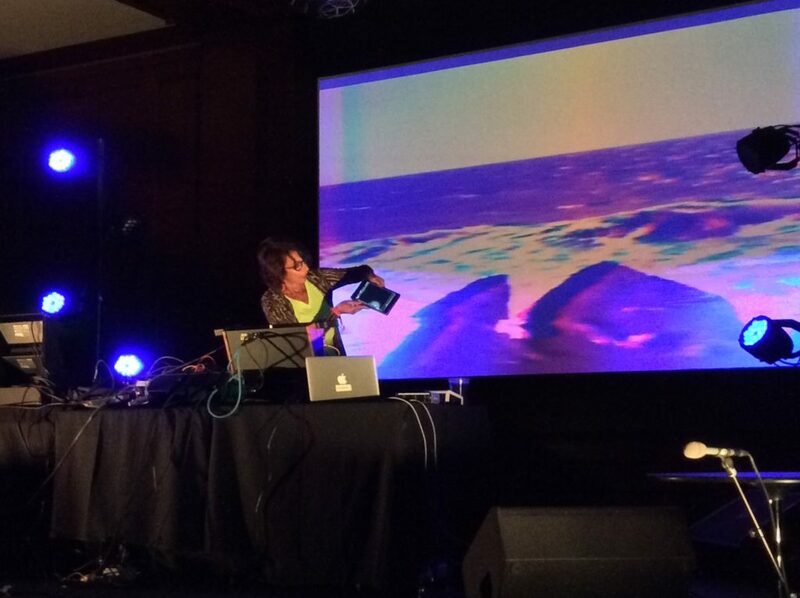 Moogfest 2016 provided the opportunity to listen to difficult-to-find artists such as Suzanne Ciani, well known for her pioneering work with modular synthesizer in the 70’s. Moogfest 2016 has been totally great! But as an Animoog player, were there any deceptions at Moogfest 2016? There wasn’t time to be deceived, so many exciting things going on! But yes, I do not fully understand why Moog Music apps were not showcased anywhere, not a single mention in the Moog Music space adjacent to the Modular Marketplace. Animoog itself nowhere to be seen, but much more stranger, not even a mention of the Moog Model 15 app that was launched less than three weeks before the event! I do understand that they can’t showcase all of their products, but I think they would have sold lots of Model 15 and Animoog apps considering they are attractively priced when compared to music hardware sold at Moogfest. I would have liked more music enthusiasts exposed to those wonderful app-instruments I like so much. Here’s the three recap videos published by Moog Music themselves. It’s focused on the music shows of the festival, I suspect that’s why they haven’t provided a video for the fourth day which did not have shows at night time. Moogfest 2016 ended up being something special to me. Has this first hand report helped you figure out if Moogfest is an event you’d like to participate in the future? Moogfest 2017 will take place in Durham as well on similar dates, May 18-21th 2017. Dear Animoog enthusiasts — a quick note to let you know that if you interested in my tweets while I’m participating to MoogFest 2016, simple follow Animoog.org’s Twitter account @animooglove — I’ll certainly publish a post after the festival ends and I get some time writing it. I’m happy to inform you that I’ll be attending Moogfest 2016 next month, to be held in Durham, North Carolina, May 19-22th. 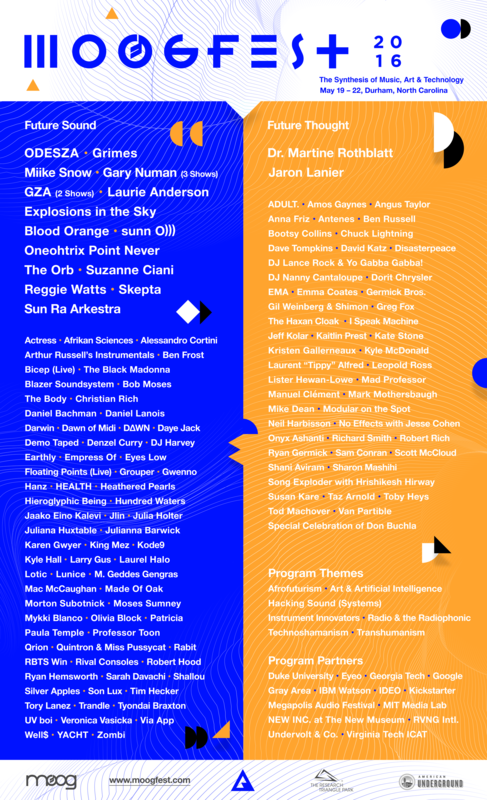 Moogfest is an annual, multi-day music, art and technology festival. […] The performing artists are not only those who use Moog instruments for their own works, but also those who create musical experiences that embody the essence of Bob Moog’s visionary and creative spirit. The festival also offers interactive experiences, visual art exhibitions, installations, film screenings, panel discussions, question and answer sessions, and workshops. I’m excited! Here’s a list of some of the participants, to give you an idea of who’s showing up (click the image for a larger version). The detailed 4-days program has been announced yesterday and is accessible to everyone. Chances are that if you’re reading animoog.org, you already own Animoog! Let’s see this as an opportunity to tell your friends about it or buy the iPhone version or the iPad version if you don’t already have it.